Did you watch Life On Mars? The U.S. version, not the English version. How about Awake, the show on NBC in 2011 about the detective who was living two lives. He knows that in one he's awake and in the other he's dreaming, but he doesn't know which is which. I did. I watched them both and really liked them both. Both lasted one season. I used to watch a lot of TV. Not an obscene amount, but a lot. I had my shows that I liked. I was always an episode or two behind, but I kept up. Then a couple of seasons ago I got behind. I looked at the DVR and there were six episodes of one show on there. Eight of another. Seeing that, something clicked in me. I think I realized that I was so far behind it would take a concerted effort on my part to get caught up, and I just didn't have the desire to put forth that effort. So I deleted every episode of what I had saved. I just walked away from those shows. No more Elementary. No more Person Of Interest. The only thing I had left was Castle. So going into this season, my decks were pretty clear. I could add shows if I wanted. Not much interested me except for Almost Human on Fox. I was excited by the premise. It was a bit like Chasing Filthy Lucre. Not a lot, but they had similarities. Then it aired, and it was actually good. The characters played well off one another. The hero is flawed. His partner was really a partner. I enjoyed it. Then I heard the talk. The show was expensive to produce. The audience had dwindled a bit after a strong opening. I was nervous. This was going to be another Life On Mars. It was going to be another Awake. A show I like a lot is going to get cancelled. Well, the announcement came down at the end of April. 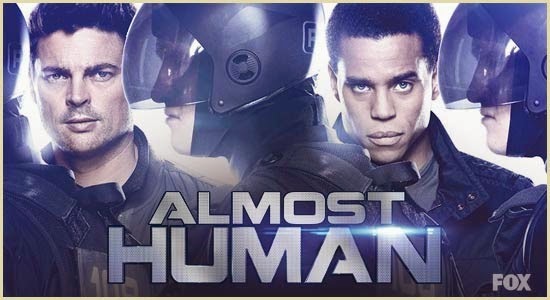 Almost Human:Cancelled. I've been thinking about this. I'm tired of investing my time in something with nothing to show for it. So what I want to do is make a proposal to all of you Hollywood folks out there. All you actors, producers, directors. Anyone who has to commit to work on a TV series. If you get on a show and things aren't what you thought they'd be, I can help. For a modest fee, I will watch your show. I will become a fan. That way you can get out of your obligation. Because you are guaranteed that if I like your show it won't be around for Season 2. Heck, if I really like it, your show may not make it to mid-season. So, I know that I'm supposed to think, what a great story of devotion, and I do. It's heartwarming at the end. But what I also thought, and rather surprisingly, I suppose, was that "Man, as a kid, I really believed in the power of the right pair of shoes." So when he puts his shoe back on and the music swells a bit and he walks out of the store confidently, I totally got that. When I was younger, in my head, there was nothing that I couldn't do with a new pair of shoes. I ran faster. I jumped higher. I turned quicker. I'd go to the end of the aisle, have my mom stand at the other end and tell her to watch how fast I could run and then how quickly I could stop. And I still think the right pair of shoes could make this 40 year old body a step faster. Looking back at the most recent posts here, you'd think I'm a bit musically obsessed. I'm not. That's my brother. But I do like what I like. And I kind of run through phases. I'll be in old country for a while. Then I'll find some bluesy rock that's really scratching a musical itch. I recently started using Spotify at work. I don't really have a good reason for not signing up before. I was a Pandora guy, and I'd spent enough time giving songs a thumbs up or thumbs down that I had stations that were pretty much perfect. At least to my ears. I still listen to Pandora quite a bit, but Spotify's different, and I don't think I appreciated those differences until I started playing with it. I'm still new to the platform, but the thing I've done the most with it so far is to get reacquainted with albums that I used to love, particularly late high school through college. That leads me to my current musical obsession — Whiskeytown. This group, led by Ryan Adams, put out the album Strangers Almanac in 1997 and a local radio station played the song 16 Days from that album. I don't typically buy an album for one song, but this one I did. I loved that song, but the entire album is great. Here's the link to it on Spotify. Take a listen. And if you don't have a Spotify account, sign up for one of those too. Ellie's growing up. Dad is too. Some of my most distinct memories from childhood are playing with cousins and friends in someone's backyard in Kansas City. The yards always seemed bigger up there for some reason. I suppose part of that is because they were bigger. The homes are older and built on larger lots. While we played, though, the adults sat in folding chairs on the patio. They talked. The kids burned off extra energy. This Easter I became one of the adults, and it seemed both weird and special. Ellie has two cousins on Gina's side, one a little older and one a little younger. And this was really the first time all three of them could go out in the backyard of Gina's parents house and play. There's a jungle gym out there. Ellie kept climbing up to ride the slide (In that picture up top she's getting ready to go down the slide). She played in the dirt with her older cousin. I brought my camera and felt like I should grab a few pictures. I haven't been taking enough pictures of her lately. She's almost 2 now, and she's changing so fast. I should be documenting it better than I have been. She's not the only one growing up, though. I'm starting to have those moments where tables are turned, and I'm sitting on a side that's not all that familiar, the adult side.